The widespread use of air conditioning; increased mobility due to creation of the national high system and other modes of transportation; the weather. Any and all of these reasons, and many others, have contributed to steadily rising population in the Southeast United States over the last half century. Mirroring the population, economic fortunes also have risen in a region that at one time was the nation’s poorest. With city, county and state governments onboard, manufacturing has found a home in the Sunshine Belt, promising jobs, revenue and long-term economic stability for inhabitants. Following the upward trend, and also a major contributor, is the automotive industry, led by transplant OEMs. Two Southeast states, Alabama and Mississippi, show just how big the contribution is. Mississippi recently lured a Toyota vehicle assembly plant to Blue Springs, near Tupelo, which will go online in 2010 producing an expected 150,000 Highlander SUVs annually. The state already has a Nissan plant, located in Canton, producing Titan and Armada pickup trucks, Altima sedan, Quest minivan and Infiniti QX56 SUV. Alabama also boasts a number of automotive OEM plants. The Toyota plant in Huntsville produces V6 and V8 engines for Toyota assembly plants in North America. A Honda plant in Lincoln produces the Odyssey minivan and Pilot SUV as well as the V-6 engines that power them. The plant recently announced it will add a 27,000-sq.-ft. steel blanking facility to improve efficiency in cost, quality and delivery for its Alabama manufacturing operations. Mercedes-Benz also has a home in Alabama, manufacturing M-, R- and GL-Class vehicles in Vance. In Montgomery, Hyundai built its first U.S. assembly and manufacturing plant, now producing the Sonata sedan and Santa Fe SUV. Isuzu recently bought land in Birmingham, reportedly for assembly of pickup trucks. Plans call for production to begin in 2010. Of course, with the OEMs come their suppliers—transplant and domestic. For example, in 2004, to provide interior door panels and floor pans to Hyundai in Montgomery, the carmaker, with Shin Young Metal of South Korea, opened Stamped Metal American Research Technologies, or SMART. The Tier One supplier is housed in a 500,000-sq.-ft. plant in Crenshaw County, 38 miles from the Hyundai plant. Another Tier One, Ogihara America Corp., opened its doors in 1987 to stamp and sub-assemble body panels for the Big Three in Michigan. In 1996, the company—formed by Ogihara Japan, a huge tool-and-die maker seeking an opportunity to use its own tooling—built a plant in Birmingham, AL, to provide body panels for automakers operating in the Southern states. A smart move, seeing as the South in general is expected to account for 26 percent of U.S. auto production by 2012, with a quarter of that provided by Alabama and its projected 50,000-plus auto-industry workers. All of this auto action has meant new work for domestic tier suppliers. That’s the case for Grenada Stamping and Assembly, Grenada, MS, a Tier One and Two operation owned by ICE Industries, which purchased the plant in 2005. ICE Grenada employs highly automated robotic-welding, material-handling, assembly and packaging processes, producing high-volume stampings and subassemblies via single-operation dies and progressive tooling with in-die-welding capability. This new feed system provides material to a 1500-ton press at ICE Grenada Stamping & Assembly, Grenada, MS. The line helps produce 4.4 million parts annually for a Tier One customer. ICE Grenada, with 400,000 sq. ft. of manufacturing space, now ships parts to Nissan in Canton and Smyrna, TN, and a Nissan plant in Mexico. Ford also is a customer, as well as Tier Ones such as Tower Automotive. “We’ve seen more automotive suppliers setting up shop here, and that has meant more opportunities coming our ,” says Anderson, noting that even though ICE Grenada ships to OEMs, most of its business is in a Tier Two capacity. To provide that backup and continue to serve its customers’ changing needs, especially the greater emphasis on thicker parts of higher-strength materials, the company has invested in more robust presses and feed equipment. One big addition at ICE Grenada: a 1000-ton blanking press and coil feeder. “That press has added more to our versatility than anything,” Anderson says. The company had been tying up its production presses to make blanks, or purchased them from outside, costly alternatives that hampered the part-production schedule and brought inventory concerns. The company brought in another piece of equipment, a 600-ton high-speed Minster press, to service a customer that recently built a plant in the South. In late 2006, Raybestos Products opened a facility in Greenwood, MS, 35 miles from Grenada. Shortly thereafter, a chance meeting led to an agreement for ICE to provide Raybestos with parts for that company’s wet-friction operations, which supply wet clutches, wet brakes, torque converters, differentials and synchronizers used in off-high as well as automotive and truck and bus markets. The contract calls for ICE, employing the Minster press obtained from Raybestos, as well as a recently acquired 1500-ton Verson press and a new Perfecto coil feeder, to supply 4.4 million parts annually for the next three years. Equipment addition hasn’t ended there. Already with four five-press tandem lines in place, ICE Grenada is working with county and state officials—the county owns the building—on infrastructure improvements to bring a fifth tandem line onsite. With all of this action, Anderson sees a bright metalforming future for ICE Grenada and for the South and Southeast. “I think the shift of manufacturing to this region is a permanent trend, begun years ago with automotive, appliance and other industries,” he says. “A big driver is the population base, considering high-growth areas like Georgia, Florida and Texas, and many companies want to be closer to the growing base. And the transplant automotive manufacturers in particular are looking for a business-friendly environment. As an example, ThyssenKrupp has broken ground for a carbon- and stainless-steel processing plant in Calvert, AL. The huge facility, at a cost of $3.7 billion, will have an eventual annual capacity of 4.1 million metric tons of carbon-steel strip and 1 million mtons of stainless strip. The facility will include a hot-strip mill as well as cold-rolling and hot-dip-coating capabilities. A stainless melt shop onsite will produce slabs for processing on the hot-strip mill. For cold rolling the facility is designed to initially produce 350,000 mtons of cold strip, and 125,000 mtons of pickled hot strip annually. Of course, automotive is not the only game in the Southeast. Another metalformer, this one in Alabama, has seen much of its success come via the appliance market. T&C Stamping, Inc., is located in a 95,000-sq.-ft. building in Athens, AL, near Huntsville in the northern part of the state. Here, about 100 employees conduct nearly $20 million in business annually via stamping, assembly and welding, in addition to machining courtesy of the company’s full-service tool-and-die operation. 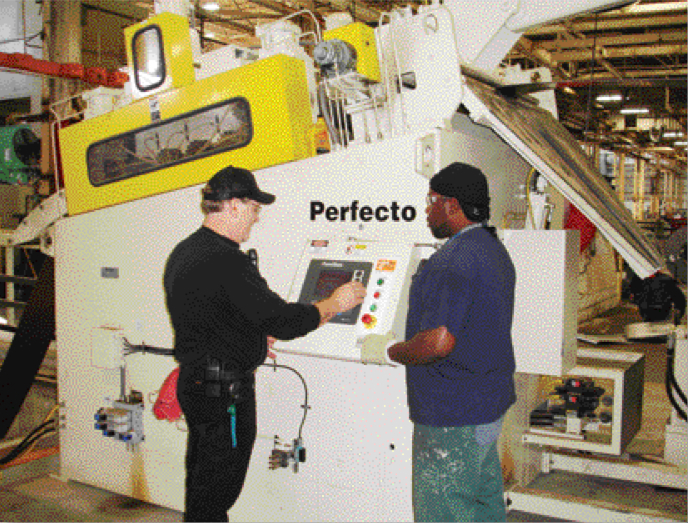 The company taps local partners for services such as heattreating, plating and other finishing. That said, the company still gets about 25 percent of its business from the automotive sector, “but a lot of our business involves appliance parts and control components, and that has become more competitive in recent years,” Coleman offers. Just like anywhere else, Asian competition is driving pricing. Luckily, T&C can employ its inhouse tooling department, and its 18 tool-and-die makers, to stave off foreign competitors. 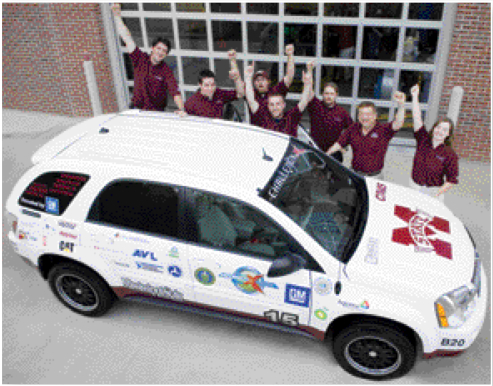 In spring 2007, the Challenge X team from Mississippi State University’s Center for Advanced Vehicular Systems won first place in a national competition to redesign a fuel-efficient and environmentally friendly SUV. Here some of winning students pose with their entry, a hybrid Chevrolet Equinox running on an electric motor and diesel engine using biodiesel fuel. “Because potential customers can buy tools from Asia for one-fourth of the cost of the market price here in the United States, we have been forced to do things a bit differently,” says Coleman. “For example, in some cases we subsidize tooling—pay for some of a customer’s tool cost ourselves—allowing us to build the tooling and then get the stamping work from that customer. At the end of the day, we are after the manufacturing—that is what pays the bills. So, we may leverage our toolmakers, since they will be here any, and if we can build a tool and subsidize it a bit, then we’ll get the manufacturing work. That is one of our strategies. For T&C, innovation means automation. The company employs technology for part detection and die protection, with heavily sensored tooling. In addition, its 60 presses, from 22 to 200 tons in bed sizes to 48 by 72 in. and shut heights to 24 in., are equipped with automatic feed systems. These improvements have allowed the company to gain greater part consistency and quality as well as improved production speed with less operator involvement. “In parts without a lot of value-added, our productivity improvements allow us to compete with Asian stampers,” says Coleman. “With material cost basically the same, if we have a part that we can stamp with a minimal amount of labor, we can match their prices. 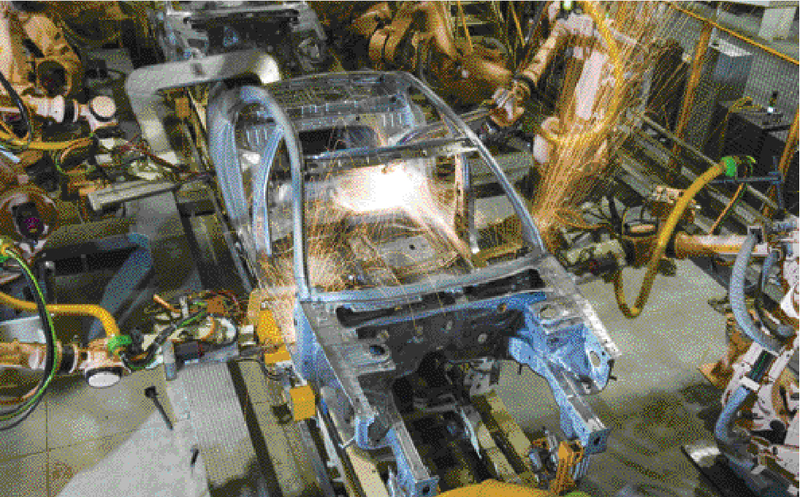 The influx of manufacturing, especially auto-related, puts a premium on a capable workforce. That has drawn the attention of the educational community, with many universities in Mississippi and Alabama offering degree programs tailored to automotive management, manufacturing and design, and working with OEMs on automotive research. In addition, local community colleges and vocational schools provide training programs to boost skill levels. Mississippi State University in Starkville is home to the Center for Advanced Vehicular Systems (CAVS), with a CAVS extension located in Canton near a Nissan assembly plant. Formed in 2001, CAVS seeks to unite research and development at the university and state level with the automotive manufacturing industry. The University of Southern Mississippi in Hattiesburg houses the Polymer Research Institute that includes one of the most advanced rapid-prototyping systems in the world. And the University of Mississippi is conducting research and development with Toyota. Providing training to companies located in Mississippi is the Center for Manufacturing Technology Excellence. That option, combined with programs available through the state’s community/ junior college system, according to state officials, has been successful at training workers at Tier One and Two automotive suppliers. The Alabama Technology Network of the Alabama College System, the state’s affiliate of the Manufacturing Extension Partnership, links two-year colleges, the University of Alabama System, Auburn University and the Economic Development Partnership of Alabama to provide hands-on assistance and training to smaller manufacturers. The Alabama Industrial Development Training (AIDT) program provides job-specific training to businesses and potential employees. AIDT also assists in job placement for employers, with program officials noting that the program currently is assisting 20 employers to fill more than 2500 jobs throughout the state. In addition, numerous state universities have adopted automotive- and other industrial-related degree programs and formed research/development partnerships with manufacturers. Of course, Coleman notes, complex stampings and value-added processes that push the edge of the capability envelope have a greater chance of remaining in North America. “Tooling is really the heart of our business, and we try to go after stamping work where our toolmakers can add some value to the process,” he says. “If a value-added operation can be accomplished through tooling design without increasing labor cost, there’s a good possibility it will remain at a domestic source. In addition, with value-added processes such as heattreating and plating, stamping often ends up being the simple part of the process. By working closely with our heattreating and finishing sources, we can optimize those processes and deliver a higher level of quality to our customers. Customers place a value on this service especially as their own inhouse design and process resources are reduced. Coleman estimates that 80 percent of T&C’s business ships to companies along the U.S.-Mexico border, including a significant number of mequilladoras, and cites that as a major reason for the company’s growth. “About 10 years ago we noticed that companies transitioned from vertically integrated operations that performed nearly all processes inhouse,” he recalls. “As they prepared to move to lower-cost areas such as Mexico, they farmed out all of the discipline operations such as stamping, screw machining, casting, etc., and just moved the assembly to Mexico. So we picked up a lot of business through that transition. Also helping the company grow is the training provided to T&C employees with assistance from local and state programs. Coleman cited the excellent lean-manufacturing training his company received through a program provided by the University of Alabama-Huntsville, and recounted another major example of state training assistance. BirminghamApril 1-3, the Precision Metalforming Association will once again present the METALFORM stamping and fabricating exposition and conference, this time in a new location, Birmingham, AL—the heart of the next generation of metalforming in the United States. Whether you’re an established metalformer, a recent start-up or just exploring the market, attend METALFORM Birmingham to upgrade your equipment, furnish your new facility, discover investment opportunities, and build partnerships and alliances. METALFORM Birmingham will feature 350 exhibiting companies showcasing the industry’s latest products and solutions for metal stamping, forming and fabricating, and also including welding, assembly and other value-added technologies. For attendee and exhibitor information, visit http://www.metalform.com/.